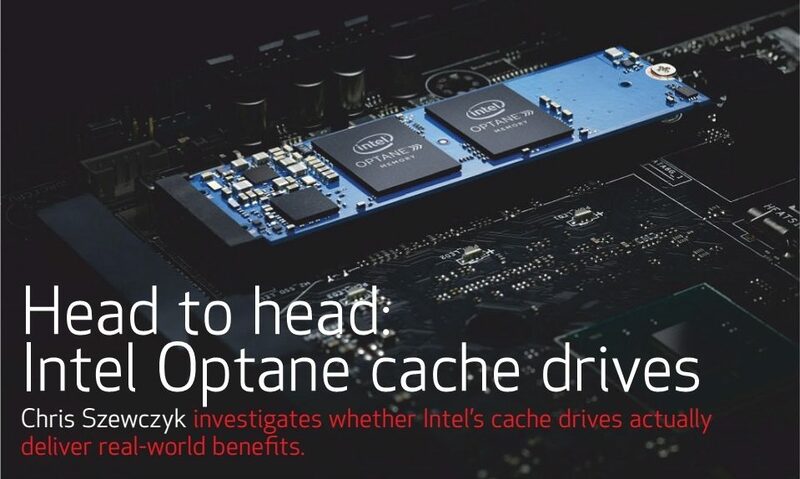 Chris Szewczyk investigate whether Intel’s cache drives actually deliver real-world benefits. Intel’s Optane storage technology has all the potential to be a game changer. According to Intel, Optane products have the capability to be orders of magnitude faster than traditional SSD solutions, never mind traditional hard drives. While there are already large capacity Optane drives that serve as NAND SSD replacements on the market, their cost relegates them to those with deep pockets or for use with professional applications. HOW DOES IT PERFORM ? Intel’s plans for the mainstream market are much more grounded in reality. The excellent low latency read performance characteristics of Optane products makes them ideal cache drives. Pairing a low capacity Optane drive with a mechanical hard drive promises to massively accelerate performance, while keeping costs to a minimum. These are lofty promises, and in this article we’ll go over why a cache drive can benefit your desktop system or laptop, and put Optane’s caching capabilities to the test. The Optane Memory Module uses a standard M.2 2280 form factor. It’s compatible with 7th Gen Kaby Lake and newer processors. It requires BIOS support and is used in conjunction with Intel’s Rapid Storage Technology. Optane drives are increasingly being offered as options in laptops, with the affordability of 16GB and 32GB drives and compatibility with standard M.2 slots making them a simple add on. When enabled, the Optane drive is invisible to the user; it acts purely as a background cache. Optane SSDs used as cache come in M.2 form factors. To test the effectiveness of Optane technology as a cache solution, we configured two identical-spec Dell Inspiron 5570 laptops, one was equipped with a small and affordable 16GB Optane drive, while the other was not. 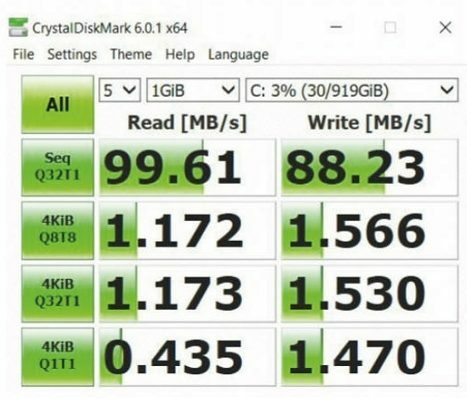 What is it that makes an SSD perceptibly faster than a mechanical hard drive? It’s primarily the access times and random read operations. Your operating system is accessing small files all the time, and when you pile up thousands of these small reads, the difference between the millisecond access times of a HDD and the microseconds of an SSD become painfully obvious. The purpose of a cache drive is to bridge the gap between inexpensive HDDs and more expensive large capacity SSDs. Essentially you get the best of both worlds — affordable high capacity HDD storage combined with SSD level performance. The HDD offers very poor performance. But with an Optane cache, well, the results speak for themselves. When you pile up thousands of these small reads, the difference between the millisecond access times of a HDD and the microseconds of an SSD become painfully obvious. 16GB is not very big, and you’ll likely see better results with a 32GB or higher drive, but if you do that, you’re getting towards the price of a standalone SSD. If you’re on a budget and want an affordable way to give your system a boost, we think its money well spent. Let’s look at the two CrystalDiskMark results above. The one on the left shows the storage transfer speeds using just the hard drive, while the one on the right shows the same spec system with Optane caching enabled. These results are not just in another league — they’re in another sport. It’s embarrassing really, but the numbers don’t lie. How does it ‘feel’ though? Well, the laptop boot time is massively improved. During bootup without Optane enabled, you can hear the hard drive going crazy accessing all those tiny files. Even after reaching the Windows desktop, there is some lag before being able to open an application such as a web browser. With Optane caching enabled, these delays are largely absent. Due to the small size of the drive, actual test results are highly variable as data gets moved on and off the cache drive quite regularly. Everyday frequently accessed applications, like a browser or spreadsheet, get quite a speedup, but something requiring a large amount of space like a game sees little benefit. We tried opening and closing Far Cry 5 a few times and we did see improvements, but doing so also flushes a lot of the cache, particularly core OS files, which is where the real benefits are to be found. This makes the 16GB drive we tested here best suited to an everyday internet/work/study/media- consumption machine. Gamers using a hard drive as their primary storage should look towards a larger Optane cache drive, or take the slightly more expensive option: and grab an SSD capable of holding entire games. Of course, Optane caching isn’t for everyone. 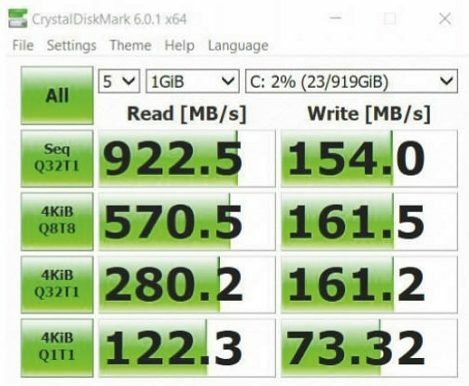 If you’ve already got an SSD, Optane won’t deliver any tangible benefit. If you’ve got a spare M.2 slot and the money to splurge on a decent capacity NVMe SSD to hold all your data, do it. You’ll get better consistency under all operating conditions, even though a small capacity Optane cache drive can beat a mighty NVMe drive in some circumstances. Games requiring a lot of storage space will load faster and have faster level transitions when the entire game is on an SSD. In the end, adding a small Optane cache drive is an affordable way to speed up a system or laptop that’s encumbered by a HDD. A high capacity SSD is ultimately still the way to go, but they cost a lot more than what a little Optane drive will cost. It’s a terrific, and underappreciated way to give your system a truly tangible speedup without breaking the bank. Adding an Intel Optane cache drive to your hard drive equipped PC or laptop provides an affordable and surprisingly tangible speedup.